- Publisher This sequel to the award-winning Renewed Day by Day, Volume 1 provides a further distillation of the wisdom Tozer gleaned from his lifelong pursuit of God. These pages are full of spiritual refreshment and mental stimulation for those who dare to walk with God and know Him intimately. 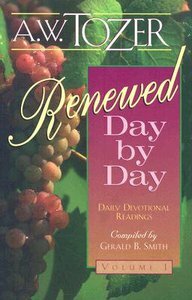 About "Renewed Day By Day (Vol 1)"
This sequel to the award-winning Renewed Day by Day, Volume 1 provides a further distillation of the wisdom Tozer gleaned from his lifelong pursuit of God. These pages are full of spiritual refreshment and mental stimulation for those who dare to walk with God and know Him intimately.